Once Upon a Time, the child Dorothy, as you'd expect, found much joy in playing with her "dollies" and singing them to sleep with her favorite lullabye, "I Have a Dear Little Dolly." She truly loved her Patsy Ann and Kewpies and especially the porcelain doll of unknown origin. As Dorothy grew up, so did her love of dolls grow into a more mature appreciation of doll art. The young woman Dorothy became a collector of sorts. But marriage to Louis and then having their eight children resulted in a doll hobby moratorium. Family needs set the couple's priorities until the children were grown. But once past this stage, Dorothy was ready to challenge herself as a business woman. Would it be anything but a nice "little" doll shop? How appropriate! Louis (a chemist by profession) encouraged the idea, eager to join in the exciting venture, and the kids all applauded. The decision made, Dear Little Dollies, Ltd. was born in 1987 in Bellmore Village, Long Island, New York. The shop was located but minutes from their home. As is the case with much of Long Island, Bellmore is considered a suburb of New York City and is easy to reach by rail or auto. It is generally about a 30 minute drive from the major New York airports. Dorothy, first president of the company, launched the venture with help from husband Louis and her daughters (four lovely young ladies). It began as a small shop, but still offered a full spectrum of dolls, including Ginnies and Raggedy Ann cloth dolls and porcelain dolls but ranged on up to very limited editions by Hildegard Günzel, Annette Himstedt and many other world class contemporary doll artists, as well exquisite antique reproduction pieces made with vintage molds and fabrics. 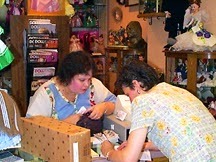 Dear Little Dollies soon attracted local doll collectors who enjoyed the selection of dolls and the friendly atmosphere. The business grew and the shop expanded into adjoining store space as opportunities occurred. The physical expansion was accompanied by continual addition of fine collectible dolls by more and more renowned artists. Still more space was needed to permit the addition of the new exquisite doll art which the Camilleri's were happy to have, so the move to a larger store commenced. An architect was engaged and the interior was completely redone, providing a spacious display area. The process of moving to the new location (thousands of dolls) was daunting but the results were rewarding as beautiful displays quickly occupied the ample new space and the number of one-of-a-kind and exclusive small edition dolls mushroomed. Today, Dear Little Dollies displays over a thousand dolls, many of which are museum caliber.The phrase "better than a museum" is often heard in the shop and it has been described as "the best doll shop in the world" by artists. 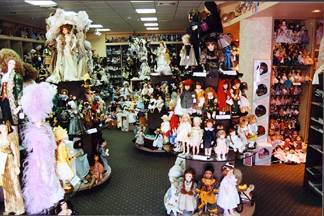 So the idea of a "little doll shop" gave way to the reality of a shop which elicits gasps of awe when doll lovers visit us for the first time. Dorothy and Louis attribute their achievement to a basic philosophy and attitude toward customers and artists...respect, fair treatment, courtesy and service, service, service when it comes to collectors. We invite all "doll people" to come visit us and see first hand what Dear Little Dollies really is. No matter if you are looking for a one of a kind, limited edition porcelain doll, collectible dolls or anything else, we think you'll be impressed.